Barack Obama may be new to the world of international diplomacy, but he has already scored an impressive victory by co-opting Iran into joining the U.S.-led efforts to rebuild Afghanistan. 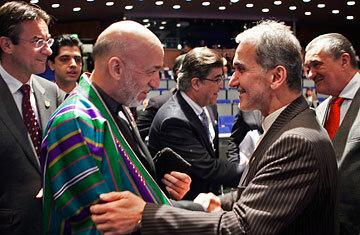 At an international, one-day conference on Afghanistan at the Hague, Tuesday, Iranian Deputy Foreign Minister Mohammad Mehdi Akhundzadeh offered to help fight the Taliban, saying that, "Iran is fully prepared to participate in the projects aimed at combating drug trafficking and plans in line with developing and reconstructing Afghanistan." But as important for Obama, who has made stabilizing Afghanistan a foreign policy priority, Tehran's offer lends unlikely international support to his new strategy for the country, unveiled last Friday. With the Taliban making inroads, allied casualties at their highest since the war began, and Al Qaeda still lurking in the remote border areas, the president's plan involves raising troop levels in Afghanistan and sharing the burden of rebuilding. The conference in The Hague  which included delegates from 70 nations  aims to internationalize reconstruction efforts. The Afghanistan issue is likely to be viewed by the new White House as a litmus test of whether Europeans can be taken seriously as strategic partners. Poll after poll in France, Germany and even Britain shows the European public want troops to be pulled out and less money spent on Afghanistan. Obama's hoping for more help. Yet the E.U. 's real impact on the country has been limited. NATO Secretary General Jaap de Hoop Scheffer has urged Europeans to "share the heavy lifting" with the U.S., but some E.U. members, like Austria, Belgium and Portugal, do not even have an accredited resident ambassador in Kabul, undercutting their governments' proclamations of support for non-military policies. Afghanistan is also expected on the agenda when Obama meets fellow NATO leaders at their summit in Strasbourg-Kehl on April 3-4. "Europe is not doing enough," says Daniel Korski, senior policy fellow at the European Council on Foreign Relations. "It does not have a coherent strategy, and as a result is doing less than it could and a lot less than the situation merits." Korski says there are a number of ways Europe can make a difference in Afghanistan, aside from simply sending more troops  from helping in the fight against corruption, to the EUPOL mission mentoring and training Afghan police. The E.U. will no doubt be relieved that Obama's new strategy is as pragmatic as it is. The new President has abandoned earlier plans to turn Afghanistan into what Defense Secretary Robert Gates called "a Central Asian Valhalla", the task is focused on basic stability: halting the Taliban's momentum and preventing the country being used as a base for terrorists. In The Hague, U.S. Secretary of State Hillary Clinton even talked of negotiations with reconcilable Taliban insurgents, promising "reintegration into a peaceful society if they are willing to abandon violence, break with al-Qaeda, and support the constitution." The immediate target is the planned August 20 presidential poll. The election adds to the challenge in Afghanistan. But if events in The Hague show anything, it is that help can come from unexpected quarters and that Obama will have to seize each chance as it comes. See who's who in Barack Obama's White House.